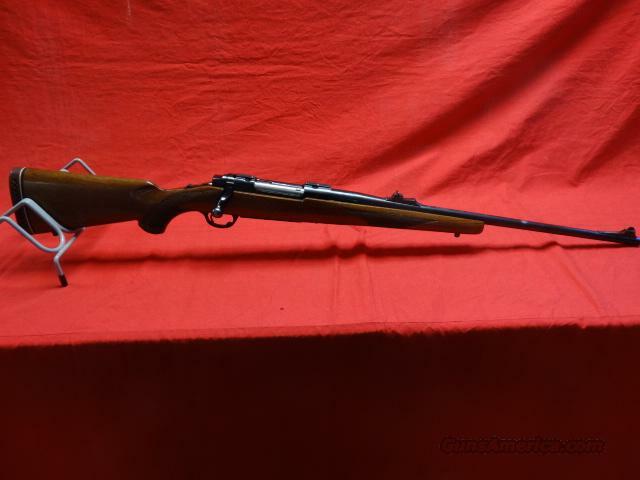 Description: RUGER M77 IN 270 WIN , IRON SIGHTS INSTALLED WHICH DO NOT APPEAR TO BE FACTORY , STOCK IS ROUGH LOTS OF DINGS IN WOOD , NO VISIBLE CRACKS . QUITE A BIT OF BLUE WEAR ON BARREL , ACTION IS TIGHT , BORE LOOKS GOOD.STILL A GOOD SHOOTER. PERFECT TRUCK GUN.GREAT DEER OR ELK GUN , OR PROJECT FOR THE GUY THAT LIKES TO REFINISH THINGS .SEE PICS . WE CHARGE ACTUAL SHIPPING COSTS . SORRY WE CAN NO - LONGER SELL , TRANSFER OR SHIP FIREARMS TO CALIFORNIA . ACTUAL SHIPPING COSTS TO YOUR LICENSED FFL DEALERS PREMISES . WE ACCEPT POSTAL MONEY ORDERS OR CERTIFIED BANK CASHIERS CHECKS , WE ALSO ACCEPT MOST MAJOR CREDIT CARDS BUT DO HAVE A 3 % SURCHARGE FOR THEIR PROCESSING . WE SHIP FED-EX ONLY .